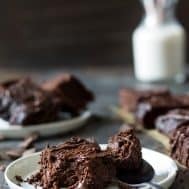 These flourless triple chocolate Paleo sweet potato brownies taste ultra rich but are actually good for you! Melted chocolate, cocoa powder and dark chocolate chips make them incredibly fudgey and packed with chocolate flavor. Gluten free, grain free, dairy free, Paleo. There is something about brownies that brings out my inner “keep-adding-chocolate” urge. As in, I literally do not have the discipline to STOP adding different types of chocolate to my brownie recipes. Whether it’s an extra fudge layer on top, caramel frosting with chocolate chunks (holla!) or my triple chocolate pumpkin ones with 85% dark chocolate thrown into the batter, um, just because. I just can’t stop! 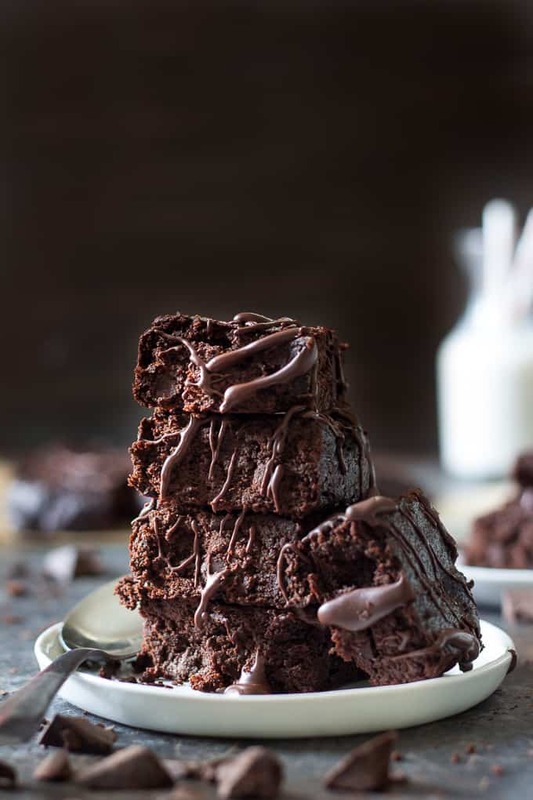 I think it’s actually very simple – you cannot mess up brownies by adding TOO MUCH chocolate – they only get fudgier, richer, and chocolate-ier, which I suspect is what you want if you’re making brownies to begin with. I don’t typically hang out with chocolate haters (we can still be friends, but, just saying.) Even still, I can’t imagine hearing a person say, after biting into a rich fudgy brownie “these brownies are okay, but, I dunno, too much rich chocolate flavor.” No. People don’t say things like that after biting into a brownie. 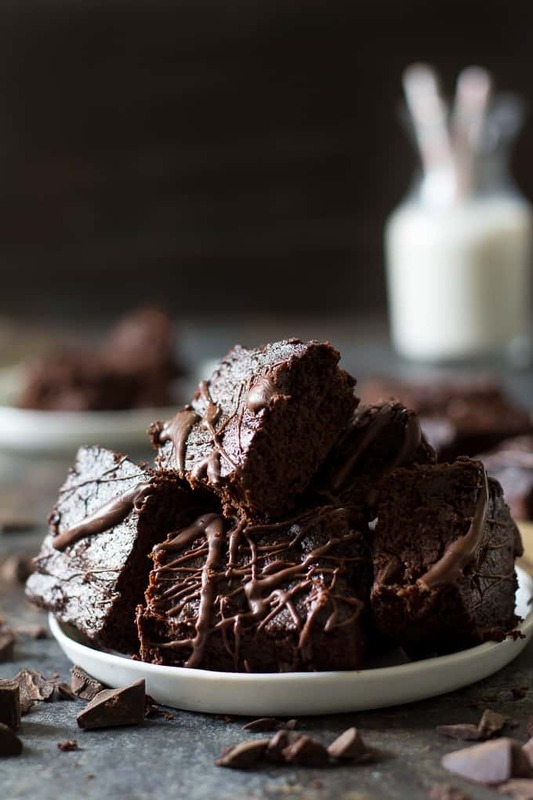 Now, even if you did know before eating one that these incredible brownies are made with sweet potato and happen to be Paleo, you definitely would NOT say, after biting into one – “I taste the sweet potato.” Because, you 100% cannot taste the sweet potato in these brownies. Much like pumpkin brownies, the sweet potato only adds to the texture, and, of course provides some natural sweetness and other good things! Good things like vitamins, fiber, and healthy, “real-food” carbs. But, maybe you can’t totally trust me on the whole “you can’t taste the sweet potato” because I’m so far gone into Paleo eating that I wouldn’t know the difference. Totally valid point – sweet potato is all I know of life some days, or something. 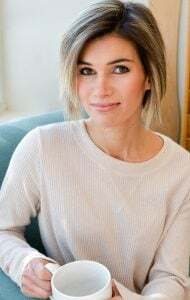 I will say that she tends to live in the moment, so take it with a grain of salt, but, at least in that moment she believed they were the best. And, she actually cannot stand sweet potato otherwise. 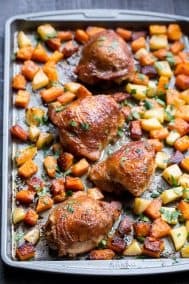 For the sweet potato mash/puree in these, I simply wrapped a sweet potato in foil and baked until soft, then scooped out the inside and mashed it well. If you want to go super easy, you can purchase organic canned sweet potato and it will work just fine for the brownies! 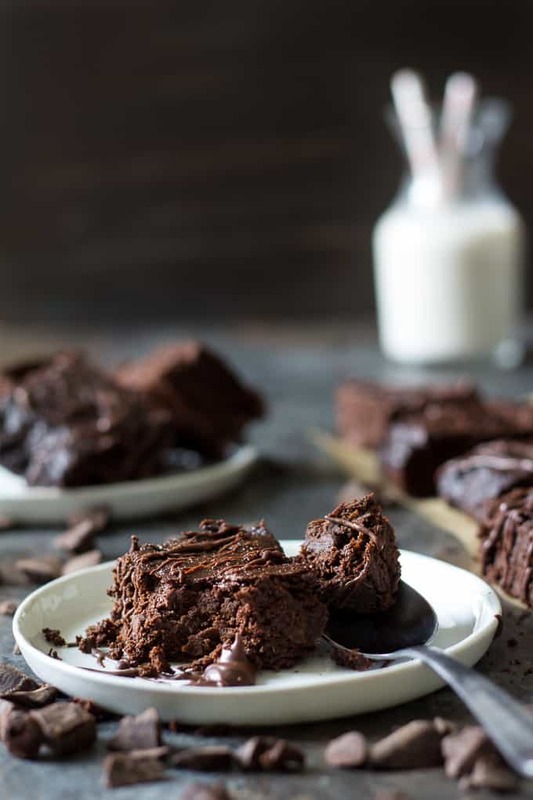 These fudgey triple chocolate sweet potato paleo brownies are packed with chocolate flavor and have an ultra rich texture that tastes purely decadent, yet they're good for you! Paleo, grain free, dairy free, flourless. In a medium saucepan over low heat, melt together the unsweetened baking chocolate and almond butter, stirring, until smooth, then remove from heat. Stir in the sweet potato puree, coconut sugar, and vanilla and beat well. Then, beat in the egg and egg yolk until creamy. In a separate small bowl, combine the cocoa powder or cacao, coconut flour, baking soda and salt. Mix the dry ingredients into the wet (still in the saucepan) until just combined, being careful not to overmix. Finally, stir in the dark chocolate chips. 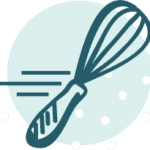 Transfer the batter into the prepared baking pan using a rubber spatula to scrape all the brownie batter into the pan and spread evenly. Bake in the preheated oven for 20-25 minutes, being careful not to overbake. Remove from oven and allow to cool in the pan completely (2 hours) before cutting into squares and serving. 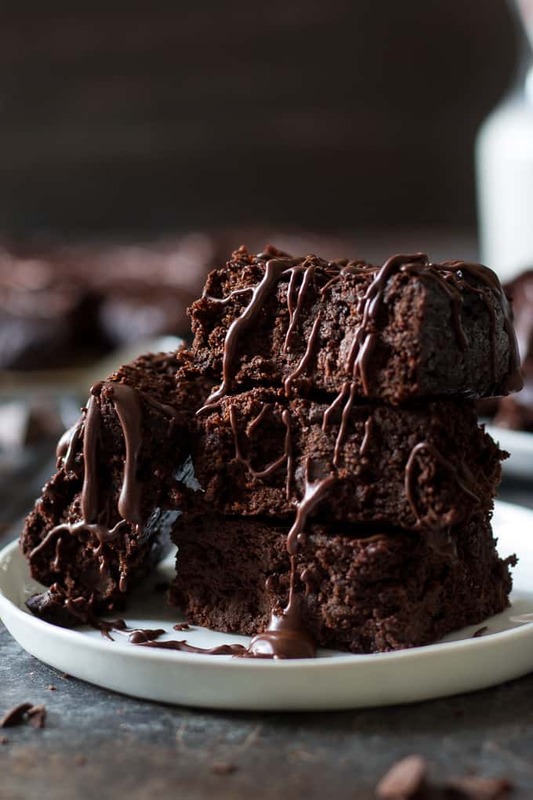 Optional - make a drizzle with 1/4 cup dark chocolate morsels and 1 tbsp coconut butter and microwave in a small bowl to melt, then drizzle over the brownies to serve. Enjoy! *I baked a sweet potato the day before making these and scooped out the inside, you can do this, or you can use canned organic sweet potato puree. **I love Enjoy Life brand dark chocolate morsels for a soy free, dairy free option. ***I used this 8" metal cake pan - metal is preferable to glass for best results. Want more Paleo brownie recipes? Try one of these! What’s something no one would ever say after biting into a brownie? 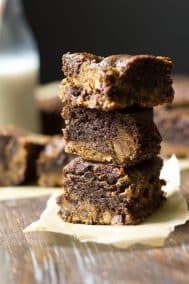 Do you like chocolate chips/chunks added to brownies? 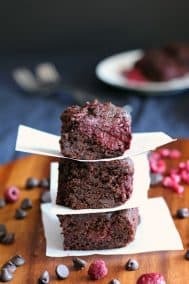 Other favorite brownie add-ins? Unsweetened baking chocolate is not easily available where I live…do you think I’d be successful if I used 85% dark chocolate and reduced coconut sugar to 1/3 cup? Yup I think that would work. Worse comes to worse they’re slightly sweeter? 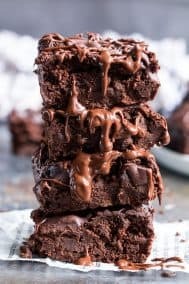 The baking chocolate melted with the almond butter at the beginning of the recipe adds a richness to the brownies that I love, if you prefer to use all cacao I’m not sure what the measurement would be since solid measures different than powder. Salted caramel is simply amazing! Yeah there’s definitely no such thing as brownies being too chocolatey. And how crazy is it that you can’t taste things like SP and pumpkin in them? I totally question my tastebuds since I’ve been eating pretty healthy for so long, but when other people can’t even tell, then I know I’ve got a winner. These look so good! Lol to the puddles! So much chocolate, not complaining! I will definitely try them, they seem perfect!!! These look AMAZING! I’m all about sweet potato in baked goods. Think I know what I’m going to be baking later….. 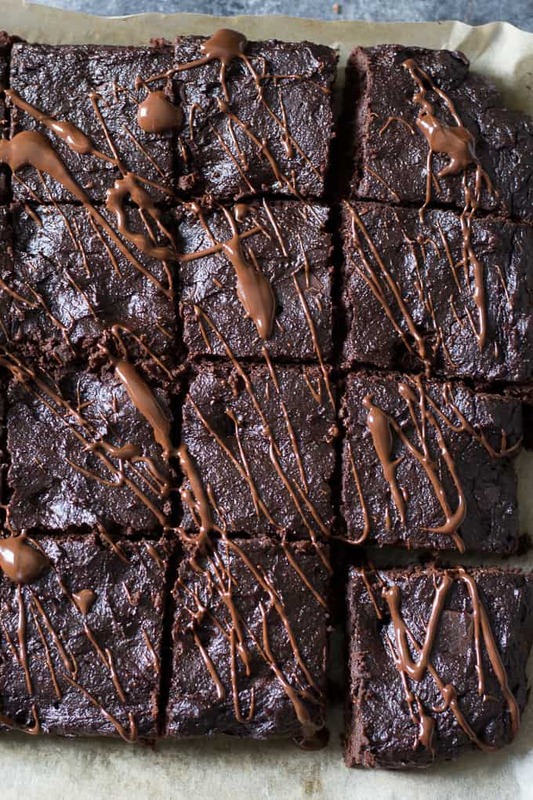 I don’t think you can have too much chocolate in brownies so I’d say the more, the merrier. Also I’m on a sweet potato bender. It’s been more savory although I certainly wouldn’t mind going sweet with these. They look phenomenal. Oh my goodness, these look so good–decadent, but with a healthy twist! These are amazing! My very hard to please carb loving son just gave them the seal of approval! He has no clue they are paleo and have sweet potatoes in them 😉 All of your recipes I have tried have been delicious! Wow that’s incredible! It’s pretty amazing that you don’t taste the sweet potato and “regular” brownie eaters approve – score! These sound amazing! Could I replace the sugar with maple syrup? Do you think it would mess up the texture? I think it would be fine, let me know how it turns out! 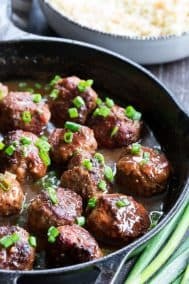 I’ve made these once already and they are SO good! I skipped the dark chocolate chips though, because all I had was regular semi sweet and decided to skip the extra carbs ;). My 4 kids and hubby loved them too, we all agreed they are so rich in chocolate flavour, they are awesome. Great! So thrilled you all liked them! These were great! I used coconut butter instead of almond butter and they turned out wonderful. Also used duck eggs instead of chicken eggs. Holy hell, these came out sooooo amazing. Maybe the best brownies I’ve ever made? To be fair, I made a few adjustments, but I doubt they changed things significantly. I used 4 tbsp of aquafaba instead of the egg and egg yolk. I also cut down on the sugar because I did not have unsweetened baking chocolate, and therefore used semi-sweet morsels (probably more like 4 oz.). I subbed peanut butter for almond butter and bumped it up to about 1/3 cup. I also added a tad more salt, and never honestly measured out the sweet potato, but it was likely close to a cup (it was two medium sweet potatoes that I roasted in the skins and peeled–they were the white kind that is ultra starchy and low moisture, so I actually had to add some water to get them to puree without clogging up the vitamix). This recipe is fun because you can play it a bit loose with volumes/amounts and it still comes out so nice. I also stirred in walnuts along with the chocolate chips at the end, for extra deliciousness. I think I’ll bake the brownies a bit longer next time, although they are pretty amazing in all their gooeyness (like they didn’t really seem raw at all, just very fudgey). Hello! Are these actually paleo since the Enjoy Life morsels include sugar? Have you found a sugar-free version of these? Thank you! I’m just like that in the summer too 🙂 Hope you enjoy! One more question — sorry! 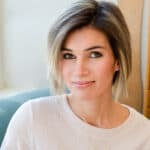 New to the Paleo scene and absolutely a paleo-baking virgin. Do you think I could sub canned pumpkin? I wasn’t able to find canned sweet potato. If not, I’ll stop being lazy and just roast off a sweet potato! Hi, this recipe looks terrific! Can’t wait to try it. Do you think a mini muffin pan would work? I’m think 10-15 min maybe? 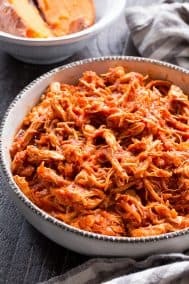 Hi there, I really want to make these for a christmas dinner but am unable to make them and serve them on the same day. 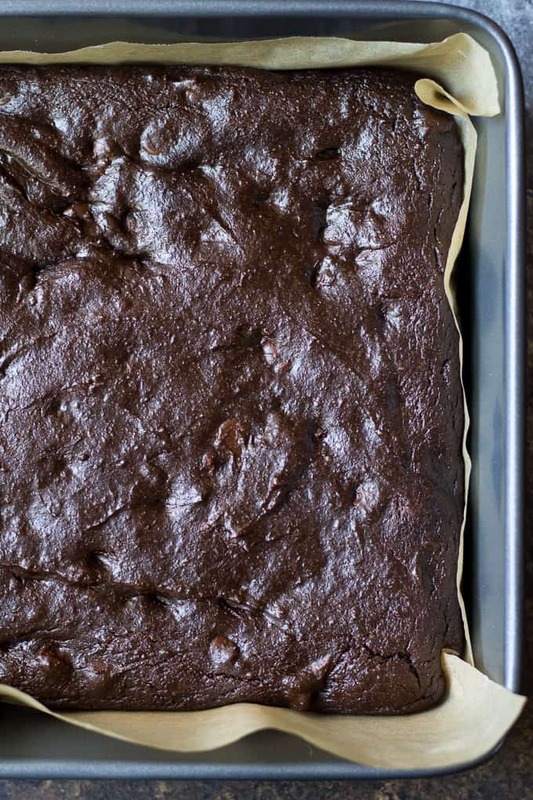 Do you have any comments on how well these brownies stay overnight? The latest I can make them is one to one 1/2 day earlier, and they will be served the night of christmas day. If you have any tips on the best way to store them for the best texture/ taste the night of serving, it would be very much appreciated!! merry christmas!! The brownies were AMAZING!! thank you so much for this wonderful recipe. I made these last weekend for a potluck and I tripled the recipe. SUPER GOOD! Even my 14-year old loved them! They’re definitely gooey, so I wouldn’t mind finding a similar recipe that has a more cake/brownie consistency. I used xylitol instead of coconut sugar, used a mix of dark chocolate and milk chocolate (both sugar free) for the mixture and the choc chips. For the ‘icing’ I also used a mix of milk and dark and melted butter with it instead of coconut butter. Absolutely delicious. Even my boyfriend who isn’t banting said they were scrumptious. Thank you!!! I am intrigued. Love sweet potatoes but never would have thought of using them in brownies. 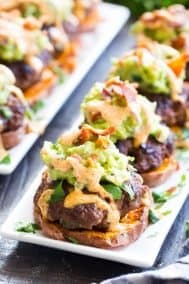 Could I substitute pumpkin puree for the sweet potato? These were so chocolatey, seriously the best paleo brownies I’ve ever had. I’m thrilled you loved them! Beautiful – no-one believes that it’s actually healthy. Hi! I don’t have sweet potatoe or squash where si live, what else can I replace it with? 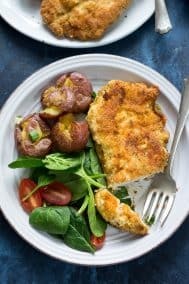 Can I use almond flour in lieu of coconut flour? I loved it. Super easy to make. Top doesn’t look smooth like regular brownies but the texture is moist. My kid thought it tasted like cocoa powder but being used to paleo, to me it doesn’t.